​Tay Son brothers were selected as the "God directed", that day was definitely the area where "natural time, localinterest, of peace. " How the story of a glorious time was still circulating in popular to this day. Not just "handed" itruins the existing objects that not long after the liberation ofthe country, the Ministry of Culture (now Ministry of Culture, Sport and Tourism) vestige calendar history-a nationalmonument from An Khe, Kong Chro until Kbang. This sacred land it on before, including the administrative unit is now Kbang district, Dak Po, Kong Chro, and the town of An Khe. Land was nearly 170 years later-from the Tay Son, the communist soldiers of the two provinces of Binh Dinh and Gia Lai chosen to stand true to day operations of the revolutionary movement still in their infancy. "God time" and "local interests" has made people here become more resilient, indomitable, courageous struggle by many generations of struggle against nature for survival and development, fighting against the forces evil to seek freedom, prosperity and happiness. I also own the land, the love and stick with it for years but the time against American. Places: Nine Director, Cuu An, An Enter ..., the Bung village, the village Kruoi, Gang To ..., the Kinh, the Venerable, people of the region, the domain is gathered here have as siblings a house, a veteran, caring shelter, "the fire lights up" with each other, share a sweet ... this way the whole way since the French resistance against the U.S. and so far, the communists " birth of a new career "this place has always been to protect her child caring. But a few days Gia Lai Party successfully held on 65 th Anniversary Party establishment. One of the cradle and nurture the growth of the Party is this land where the old people-hero Quang Trung-Nguyen Hue has started, thereby helping the Tay Son brothers from wages draft, militarymeans soldiers to serve in the wars of resistance against foreign enemies. All this talent from which the material resources, help from the Tay Son won this victory to win another great victory until the final 29-thousand troops to expel the invading Manchu, bring peace, President Best giang san. A few days ago, the opportunity to return this land, stop at the foot of Mang Yang Pass, the past is often the place of brutal war, during the war against the French, have marked the history of the seal lip nation-the decider on May 6-1954, while the French retreat from An Khe-between the main force with the French Revolution, the outcome a legion to the top of the French army had been wiped-Binh Group 100; this glorious victory of Dak Po (An Khe area that day) has significantly contributed to the final victory of the resistance war against French colonialism of our people. During the struggle against the U.S., this is also a fierce battle, the scene of many battles fought by military tenacious people, and that's confrontations with the U.S. Army-Airborne Division No. 1 - An Khe. Now, the land of tenacious, courageous high rise has transformed dramatically. Is the center of the An Khe area, is a medium town in the region. Economics has become the dominant focus area, the gateway of the Highlands, where the "connection" with the Central Coast "development triangle" of three countries Vietnam, Laos, Cambodia, but Gia Lai-TP . Pleiku is the "heart" of that triangle. 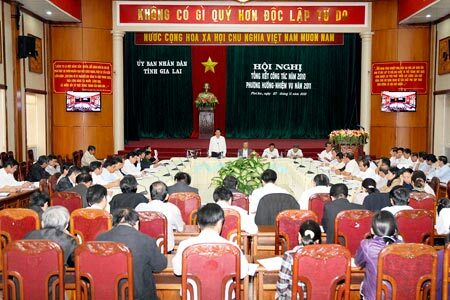 Addressing the Congress Party in Gia Lai province was recently XIV, General Secretary Nong Duc Manh has pointed out that: "Gia Lai to become the center of the Northern Highlands" and "to 2015 must be from the list of poor provinces .... " In the key points to implement this policy, An Khe is considered a landmark, a regional center of the center triangle! Along with that, Dak Po-district "junior", however "natural born after late", but was able to say that the challenge could not be a smart bunch, looking along the path 19 and further-areas of childhood poverty are considered before, are now basically out of poverty, the rural areas there has been a radical change, the lives of the majority of the people has improved markedly. Kong Chro district a few years ago is considered the poorest province, now back, seems so old and poor is getting back to the rear, with great efforts of both provincial and central level for the first Investing properly, have less than several thousand people communes each year are granted the investment capital up to the tens of billion. Last November, I have the opportunity to return Kbang, although not complete, but the road segments, Shandong University has been paved flat management, winding by winding mountain slopes, clear streams lead us from the point of departure-intersection Dong Gang-An Khe, less than an hour we were in Kbang. Recall a time before 1975, also provides road like that, but we had to go take a whole day, an uninterrupted night. But it got old, now back this way, the affluent village emerged from cover, rice fields, vast gardens, floral display bowl of rice, sugarcane garden, baking corn, hills and short-term industrial crops days ... Lane alleys contiguous between Kbang-An Khe has seemed totally concrete, asphalt.